I’m still hiding away safely in my crevice home. Phew! Well kind of, it’s still like being in a washing machine down here after Storm Freya and Storm Gareth whizzed through followed by continuing wind and rain. There is a lot of swell and 2 metre waves crashing in on my beach. Optimistically, I can feel it in the water that 2019 is going to be a good year for us tompot blennies. Us ‘bourgeois males’ (that’s the way males like me that guard a crevice territory are described) are getting busy. We’re preparing for the spring by clearing any debris from our homes, getting ready to encourage our local ladies in to lay their eggs. It’s an ongoing job at the moment because, as soon as I clear lumps of seaweed out of my home, the swell whooshes them all back in. I’m really hoping that, this year, we won’t have anything like last year’s ‘Beast from the East’ sweep over and drop the water temperature dramatically. The seawater temperature is still 9 degrees C and about to turn back up I think. The days are lengthening so spring has sprung! 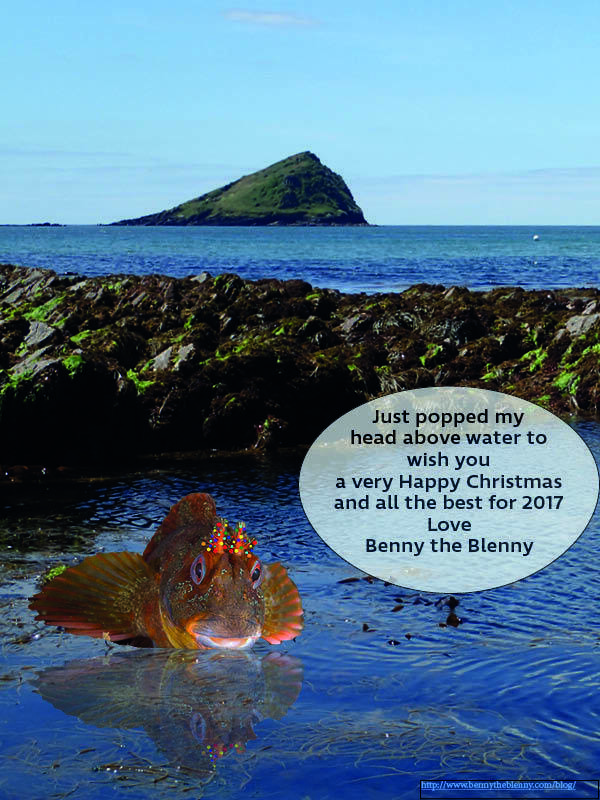 Author Benny the blennyPosted on 17th March 2019 17th March 2019 Categories Animal physiology, Beach, children's book, combtooth blenny, fish, fish with antlers, Storm, Tompot blenny, WeatherTags beach, storm, tompot blenny, waves1 Comment on Whoosh Storm Freya and Storm Gareth but no ‘Beast from the East’ this year yet! What a mouthful! How not to inspect the inside of a conger eel’s mouth! Small conger eel eating a large tompot blenny! One of the tompot blennies living on a reef nearby recently came to a grizzly end in the mouth of this young conger eel. I don’t think it would have happened to me because, unlike this poor guy’s home, my crevice has a ‘bolt hole’. Let me explain what I mean by this; an ideal crevice home has a fairly open front part where female tompots can be entertained and encouraged to lay their eggs but it also has a very narrow back part where you can hide when a streamlined predator like a conger eel pays a visit. This ‘bolt hole’ also gives extra shelter when the sea is very rough. 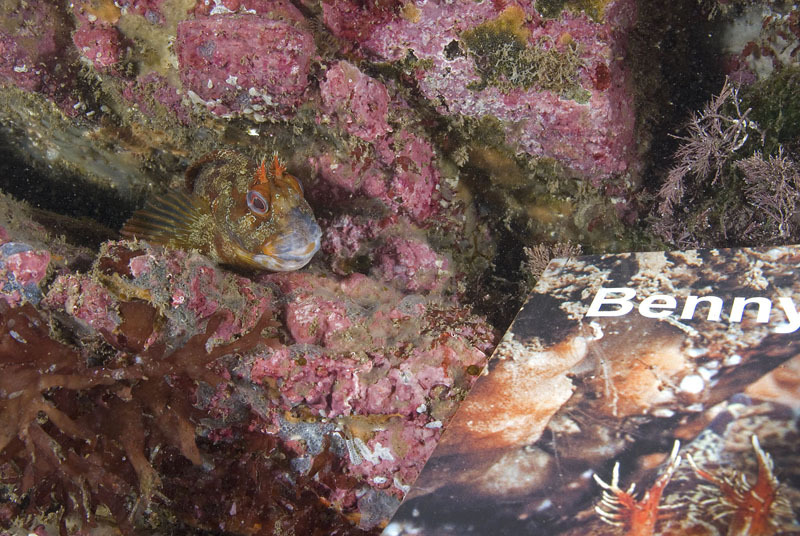 Having said all that, this poor tompot blenny was very unlucky to meet a conger eel that was just small enough to get into his home and just large enough to eat him. You can see what a struggle it was for the conger in the first photograph. Paul, my underwater photographer, saw the tompot blenny stuck in the conger’s mouth like that for over 30 minutes! When Paul and Teresa came back 12 hours later, they found a very sleepy full-bellied conger eel and no tompot blenny! 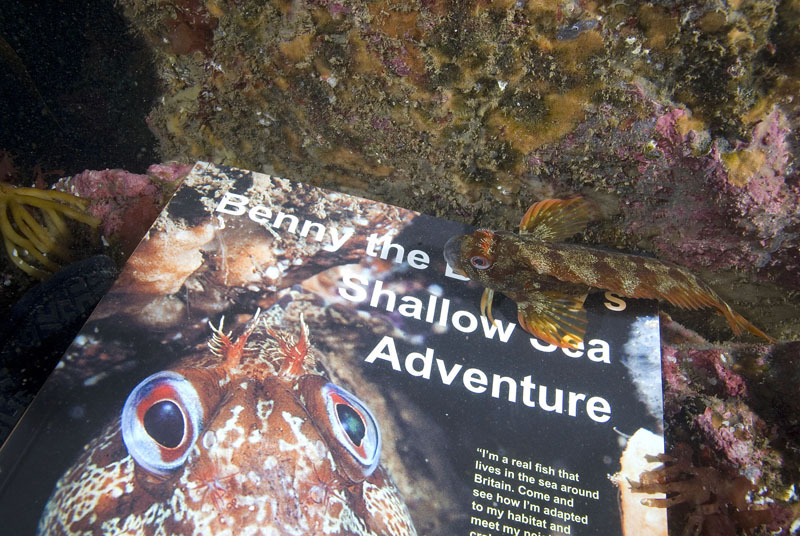 Wildlife Watch Benny the Blenny’s blog that site also has lots of other fun things to look at too. 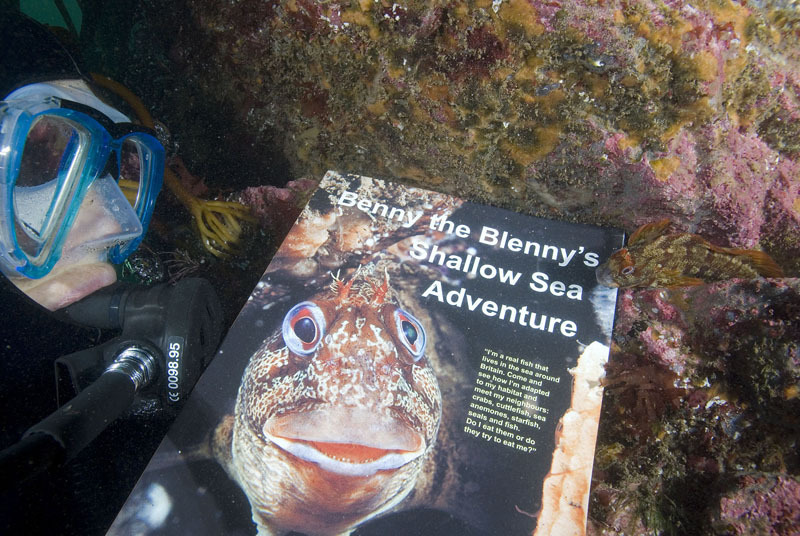 Author Benny the blennyPosted on 18th June 2016 19th June 2016 Categories children's book, fish, Underwater photographyTags beach, blenny, conger eel, fish, head tentacles, nature, ocean, tompot blenny, underwater, Wembury, wildlife2 Comments on What a mouthful! How not to inspect the inside of a conger eel’s mouth! 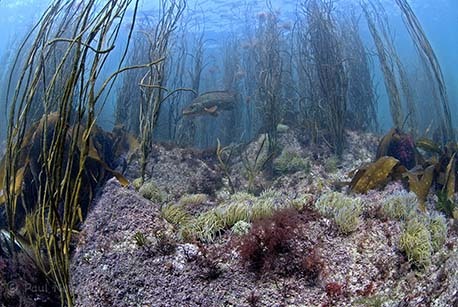 The view from my crevice home, the large fish is a ballan wrasse. For the first few weeks that I was looking after my growing raft of eggs, the view from my crevice home was stunning. I could see all the snakelocks anemones and thongweed gently swaying in the swell and several ballan wrasse (like the large fish in the photo) cruising around looking for crabs. The eggs survived storm Katie and I’ve had great fun over the last few weeks. Several female tompot blennies have been to visit to lay their eggs in my home crevice as they know I’m a good dad. I was the first of the 4 local males to be looking after eggs and it’s a sure sign that, as soon as one female has laid, others will follow quickly after. They seem to prefer to lay their eggs with a male who already has eggs; going for proven quality and safety in numbers! There’s a small male in the crevice near mine and a generous female eventually laid a few eggs with him, while she laid a lot more with me. I’m keeping a close eye on this Connemara clingfish! I’ve now got eggs on the floor and ceiling and have a lot of egg guarding to do! I was busy at the back of my crevice the other day and a sneaky Connemara clingfish dashed in and ate a few eggs that were near the front entrance to my home. As soon as I spotted the cheeky intruder, I darted over and gave him a quick nip to scare him off. Hopefully it was enough for him think twice before coming to eat my babies again! I have to be careful when I choose my crevice home as these egg thieving clingfish are able to squeeze into narrower gaps between rocks than I can. That means they can hide in parts of my home that give them easy access to my eggs but which I can’t get into to chase them out. Now that is frustrating! It’s hard work being a tompot blenny dad because lots of the reef dwellers are after my precious eggs. First the Connemara clingfish and now a topknot, a flatfish that likes to live on the rock, keeps trying to come in to my crevice. He’s quite big so I have to charge at him and nip at the same time so that he takes notice and goes away.